This Ecuador currency tip can save you big bucks in Ecuador or any time you need a foreign currency. I recently spoke at a seminar in Mexico and realized that I have become lazy about carrying multi currencies. 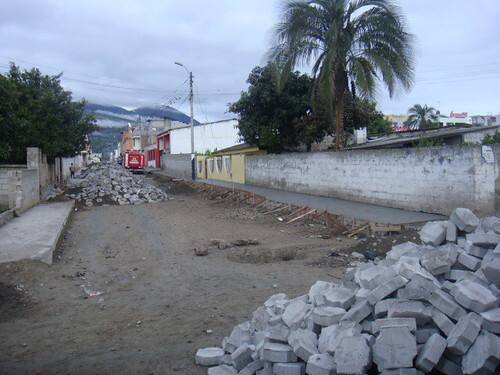 Ecuador’s currency is the US dollar so no currency exchange is required coming or going. I maintain British pound and Danish kroner investments so when I travel to Denmark or England, our two most frequently visited places after Ecuador, I already have the correct currency available in cash. So when Merri and I arrived at Cancun airport, I realized Mexican pesos would be needed! Ouch. Avoid converting currencies at airports. The forex exchange rates are usually bad. If you are frequently exchanging currencies the costs can be high, so here is a multi currency, conversion tip sent to me by a trusted friend. “Gary, It costs me about $1500 a year just to send money to the UK and Sweden in bank and FOREX charges! A friend in Australia recommended www.ozforex.com – you select a buy and sell currency and beneficiaries (destination bank accounts). So far it looks like I’m going to more than halve the annual costs of sending money and their rates seem much better. For example $1500 with current method gives £794.74 but with OZForex, £842.25 – 6% better rates and only A$15 transfer fee. The US dollar is Ecuador’s currency. Paper money is identical but both US and Ecuador coins are used. Ecuadorian coins minted in Ecuador are the same in size, weight, workmanship and color as US coins but have different reliefs and are only legal currency in Ecuador. You can bring dollars with you. They work well except $100 dollar bills. These are accepted only with caution. Outside major cities sometimes it is impossible to cash $100 dollar bills. There is a lot of counterfeiting of $100 bills in Colombia, so the Ecuador Central Bank issues a list of valid $100 bill serial numbers. If the serial number of your $100 bill (even though it is real) is not on the validated list, you may not be able to use it in many places. Bills that circulate in Ecuador are the $1, $5, $10, $20, $50 and $100. The coins are the penny, nickel, dime, quarter, fifty cent piece. Plus the one dollar coin is very popular in Ecuador. I always wondered where all the Susan B. Anthonys went! Ecuador prices are low and vendors are poor. They do not have a lot of change. When Merri and I go to Ecuador, we take rolls of quarters and a lot of $1, $5, $10, $20 bills. We never even had an ATM card in the US but found that this is a good way to access cash. We also have a safe in all our rooms in Meson de las Flores and Hotel Quito offers free safety deposit boxes so when we arrive, we just put all our cash, wallet with credit cards and passports in our safe box. Then we just have a bit of cash like $20 or so in our pockets. Merri and I live off of ATMs in Ecuador. 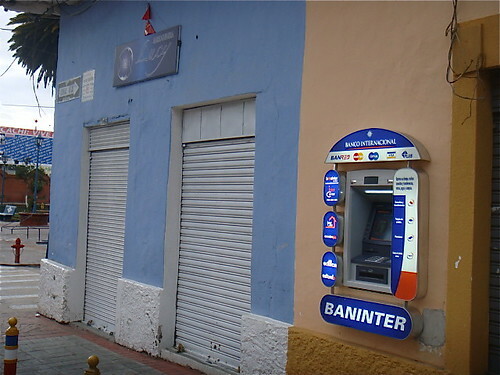 Visa credit cards work at ATMs operated by Bank of Guayaquil, Pichincha, Produbanco and Banco Pacífico. Each ATM shows the logos of which cards can be used on that machine. 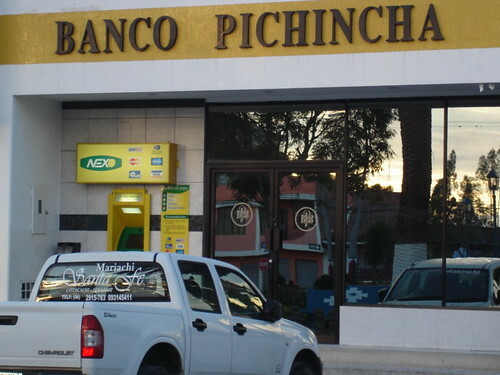 We use our regular ATM cash card issued by our Florida bank at this Bank of Pichincha branch in Cotacachi. 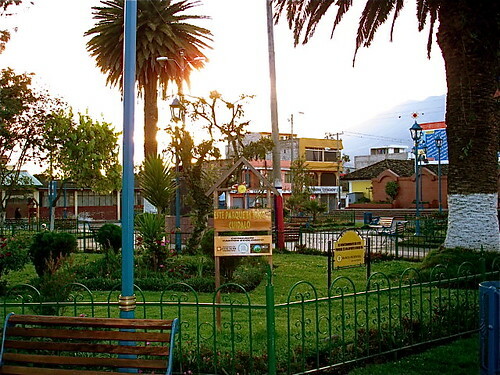 This bank is on Cotacachi’s second smaller plaza. 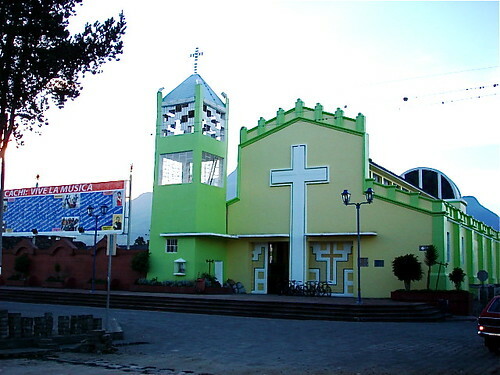 There are two Cathedrals in Cotacachi and one bank…a nice ratio. 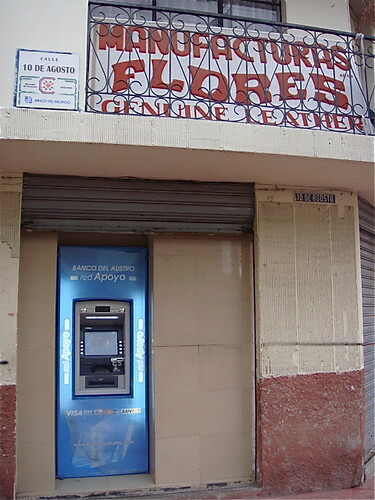 However there are two Cotacachi ATMs. The second is on the main street 10th of August. Here is a map of Cotacachi. Our hotel, El Meson de las Flores, is by the Cathedral insignia. The bank and ATM are marked by the red box. 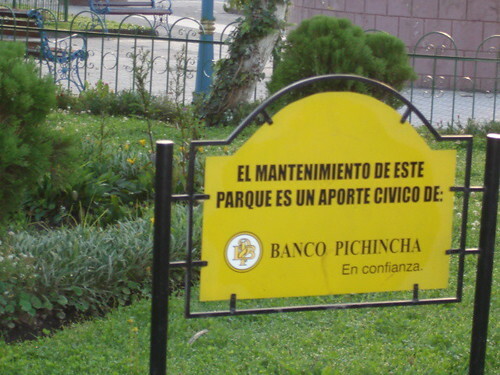 We are allowed to take $500 a day from the Pichincha ATM and $300 a day from the other. When using an ATM take the same precautions you would anywhere. Merri and I do not withdraw cash alone at night. We keep our password hidden. We observe the people around and make sure the machine is working correctly. If we were to note anything odd in the surroundings or the machine, we would not use our card. This has never happened. We have never had a problem but still always take precautions. The safest ATM’s are those that are found inside banks and shopping centers. Credit cards can be used at most hotels, restaurants and in most shops, but not in the markets. Places that are recommended for the use of credit cards are first class restaurants, hotels, gift shops, shopping centers and travel agencies. Not all places accept credit cards. Ask before buying if you do not see a Visa or MasterCard sign. Amex is not seen much outside the major cities. Vendors are gouged by the credit card companies. Some businesses charges extra, up to 12% to cover the cost of this fee they have to pay…so you can often bargain by offering cash. Bank transfers take at least three working days. The bank sending the money charges a commission for the transfer, usually $30 to $60. Western Union offers quick and efficient money transfers but is much more expensive. For example a Western union wire of $1000 to Quito, may cost $85. Merri and I do not have a bank account in Ecuador even though we live there half the year. There is one excellent bank that has a US subsidiary and the subsidiary has offices in Ecuador so you can bank in the US but access cash in Ecuador. We are compiling a complete report on “How to Bank in Ecuador” for our Ecuador Living subscribers now. 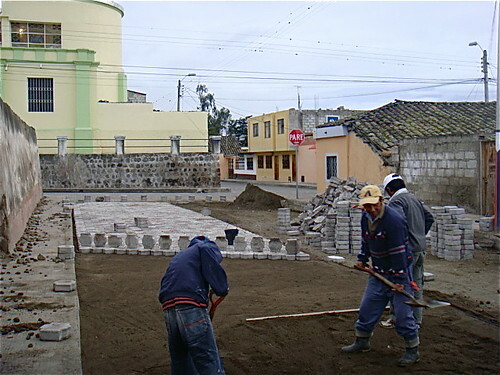 You will receive this report free when you subscribe to Ecuador Living. Until next message, may all your money be easy to access and good! Our September Spanish Class is sold out. 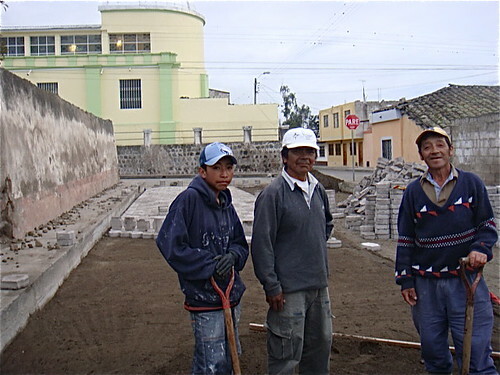 Oct 14-18 Ecuador Import Export Course has a few places left.